"Sampath Speaking" - the thoughts of an Insurer from Thiruvallikkeni: Harley Davidson bike driven away from showroom ~ is that indemnifiable ? 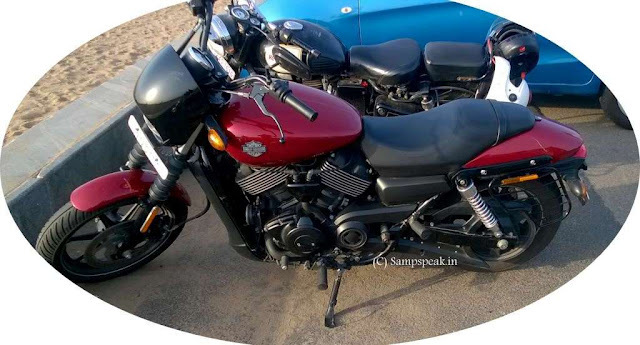 Harley Davidson bike driven away from showroom ~ is that indemnifiable ? Harley-Davidson, Inc. (H-D), is an American motorcycle manufacturer, founded in Milwaukee, Wisconsin in 1903.As one of two major American motorcycle manufacturers to survive the Great Depression, the company has survived numerous ownership arrangements, subsidiary arrangements, periods of poor economic health and product quality, as well as intense global competition — to be among the largest motorcycle manufacturers and an iconic brand widely known for its loyal following. Harley Davidson bike - a photo taken by me at Marina beach ! Valued possessions are prone to theft. Posing as a great lover of motor sports with a deep passion for Harley Davidson motorbikes, a man strode into a posh Banjara Hills showroom on Tuesday and rode away with his 'test drive' bike, reports today’s Times of India. A showroom staffer who was following him tried to keep up but eventually gave up as the mint-fresh Rs 6 lakh Harley disappeared into the horizon. The report describes that the 25-year-old man had entered the store around 2.30 pm and identified himself as a software engineer. "Hi, I would love to go for a test drive as I am planning to buy one soon," the young professional, who identified himself as Syed Tahir, had said. After a while, Tahir, wearing a cream-coloured shirt, tight jeans and a cap, had stopped next to a 'Street 750' model. "He seemed intelligent and was very suave in his appearance, and they (showroom staffers) did not think anything was wrong when they agreed to his request for a test drive," Banjara Hills inspector P Murali Krishna said. As part of the test drive process, showroom officials asked him to show his driving licence — which he promptly flashed along with a credit card. Tahir said he would pay the money after the test ride. "They noted down a mobile phone number given by him, but did not check his address, which he said was in Jubilee Hills," Krishna told TOI. Tahir also agreed to the test-ride route — a trip from the showroom to Jubilee Hillscheckpost and back. After starting the bike, Tahir did not take a U-turn in front of the showroom at Sagar Society T-junction but sped off straight towards Nagarjuna Circle. "An employee of the showroom follows a test rider on another bike, but the conman gave him the slip by going straight," the inspector said. "The employee tried to follow him, but got stuck in the traffic at the signal on road number 2." The showroom employees waited for an hour, hoping Tahir would return with the bike. After realising they had been duped, the showroom management called the police and gave them CCTV footage of the offender. Based on a complaint, the police registered a case under IPC sections 380 (theft in a building) and 420 (cheating). The showroom officials said the stolen bike did not have a GPS tracker. Moving away from this incident, on a similar case, an Official had opined that such act would not constitute a theft, as the property was knowingly parted with – and hence could only be treated as ‘breach of trust’ implying that a policy covering the same would not pay for it under theft !! Definition of Breach of Trust is :Abuse of power, or failure (whether or not deliberate, dishonest, or negligent) to carryout the general and fiduciary duties of a trustee. Trustees are personally liablefor any loss to the trust caused directly or indirectly by the breach, and must hand over (to the trust) any profit made from the breach (whether or not the trust suffered any loss). Section 406 in The Indian Penal Code deals with its punishment :406. Punishment for criminal breach of trust.—Whoever commits criminal breach of trust shall be punished with imprisonment of either description for a term which may extend to three years, or with fine, or with both. A reading of the relevant section and the explanations thereunder Indian Penal code would offer more clarity. 378. Theft.—Whoever, intending to take dishonestly any moveable property out of the possession of any person without that person’s consent, moves that property in order to such taking, is said to commit theft. Explanation 1.—A thing so long as it is attached to the earth, not being movable property, is not the subject of theft; but it becomes capable of being the subject of theft as soon as it is severed from the earth. (d) A, being Z’s servant, and entrusted by Z with the care of Z’s plate, dishonestly runs away with the plate, without Z’s consent. A has committed theft. (e) Z, going on a journey, entrusts his plate to A, the keeper of the warehouse, till Z shall return. A carries the plate to a goldsmith and sells it. Here the plate was not in Z’s possession. It could not therefore be taken out of Z’s possession, and A has not committed theft, though he may have committed criminal breach of trust. Section 379 in The Indian Penal Code :379. Punishment for theft.—Whoever commits theft shall be punished with imprisonment of either description for a term which may extend to three years, or with fine, or with both. Section 380 in The Indian Penal Code :380. Theft in dwelling house, etc.—Whoever commits theft in any building, tent or vessel, which building, tent or vessel is used as a human dwelling, or used for the custody of property, shall be punished with imprisonment of either description for a term which may extend to seven years, and shall also be liable to fine. Now you know better on whether the Insurer of the vehicle would be liable to pay for this loss or not ? – the situation could further change, if the showroom insurance covered only ‘burglarly’ as a peril and not ‘ theft ’……….. interesting !!! !